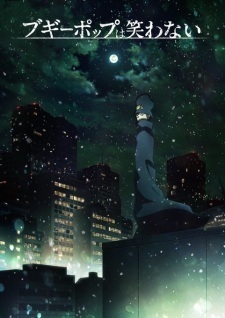 The official website for the previously announced Boogiepop wa Warawanai (2019) TV anime has announced additional cast members and theme song information. The anime will air via AT-X, Tokyo MX, TV Aichi, KBS Kyoto, Sun TV and BS11 starting January 4, 2019. First three episodes will be pre-screened via an event on December 16. Aoi Yuuki (Boogiepop & Touka Miyashita), Saori Oonishi (Nagi Kirima), Reina Kondou (Kazuko Suema), and Chiaki Kobayashi (Keiji Takeuchi) will appear for a talk show. Yoake no Boogiepop arc will be aired as 4 2-hour specials starting end of February. Overdrive Waikyoku-ou arc will also get anime adaptation but no schedule yet. @Boogiep0p Ah, right. My bad. I just checked the report news again. @Lul-oppa I believe it's one hour long ep. for first ep. like Sword Art Online: Alicization's first ep. It's not, they're playing the first two episodes back to back on its first broadcast. Airing on Fridays at 21:00 (9:00 a.m.) via AT-X, Tokyo MX, BS11, KBS Kyoto, Sun TV, and TV Aichi and starting January 4, 2019. AbemaTV will also make anime available online. First broadcast will be 1 hour. If it's one hour does that mean it is an hour long episode or is it two-three separate episodes back to back? Airing on Fridays at 21:00 (9:00 a.m.) via AT-X, Tokyo MX, BS11, KBS Kyoto, Sun TV, and TV Aichi and starting January 4, 2019. AbemaTV will also make anime available online. First broadcast will be 1 hour, airing first two eps. back to back. I actually thought this pv was fairly bad. Especially that small bit of action we did end up seeing. It was super awkward and kind of hilarious looking. Might go check out the old show at some point though. Nice, a MYTH&ROID OP that actually sounds good. Been a while. It might have to do with the fact that the first PV was pre-animated. The latest PV is a better(?) representation of how the anime will be.